(Check out my basic Roasted Root Veggie recipe - an all-time favorite.) The other night I was really in the mood for mashed potatoes, but thought I would add a little twist. The twist turned out to be not-so-little, but the result was delicious. My husband had no idea what he was eating (mashed potatoes? turnip?). Nevertheless, he finished his plate in record time. I had a fair amount of root veggies on hand, and combined them all in this literal mashup. 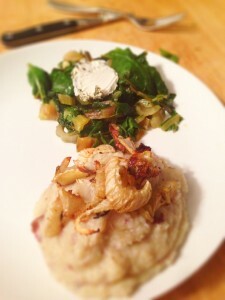 All the veggies used here have white flesh, so the result actually looked like regular mashed potatoes. The base was Japanese sweet potatoes, which look like a purple sweet potato from the outside, and a regular potato when you cut them open. If you've never tried a Japanese sweet potato before, do so immediately. They are super sweet and are delicious baked, with a little bit of coconut oil, salt and pepper. I've actually mashed one up before and eaten it as dessert. They're that sweet. Since I wasn't going for a dessert this night, I paired them with some less-sweet root veggies. Bitter turnip, peppery parsnips (like carrots with a kick! ), and mild, earthy celery root (my personal favorite). Make sure the veggies are cut into a pretty uniform size, so they cook at the same rate. Cover veggies with water in a large pot and bring to a boil. Allow to cook until veggies are softened through, about 20-25 minutes. Drain veggies and dump into a blender. Pour in milk - start with 1/4 cup, then add more to thin if necessary. Transfer back into pot and stir in coconut oil or butter. Season with salt and pepper. *Optional: Stir in goat cheese. Serve immediately. I served this with roasted fennel and sautéed Swiss chard with garlic and olive oil.